There are many different causes for Hydrocephalus. Some are present from birth whilst others are acquired later on in life. Up to half of affected people have intellectual disability that ranges from mild to severe, and those with normal intelligence may have learning disabilities. Children with Dandy–Walker malformation often have delayed development, particularly a delay in motor skills such as crawling, walking, and coordinating movements. People with Dandy–Walker malformation can also experience muscle stiffness and partial paralysis of the lower limbs (spastic paraplegia), and they may also have seizures. While rare, hearing and vision problems can be features of this condition. There are things from my childhood that I now look back on and link with Dandy-walker as I was only diagnosed with the condition just over 2 years ago but was told that I have had the condition since birth. My speech was one thing that I had trouble with when I was younger and also my muscle reflexes don’t respond to usual testing. So I said in an early post that I had undergone some ICP ops, but i didn’t tell you what the first one lead too. 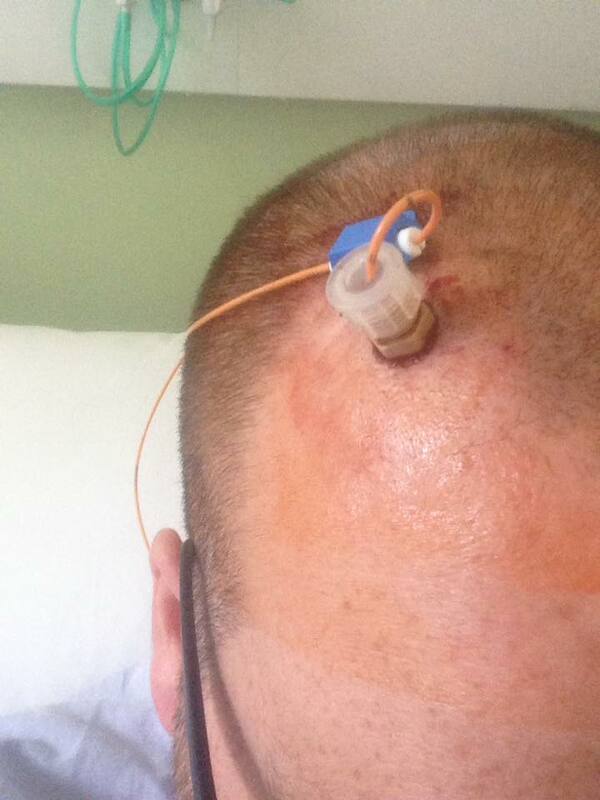 The reason I had it was because I was still experiencing some major head pain whilst being upright and my surgeon suggested that the problem was that I had been used to a high pressure for such a long time that I was finding it difficult to adjust to a “Normal” and safe pressure. He said that Shunt was working but he waste to check the exact pressure i was running at so he could determine what to do next. After the ICP gave him the info that he needed he suggested that i get a flow restrictor fitted in my neck. The Flow restrictor is a device that gets fitted to part of the tubing thats attached to your shunt and slows the flow of CSF down. It is gravity feed so only works when I’m stood upright. This was hopefully going to make me feel much better. I had my flow restrictor fitted under Local Anaesthetic so was awake for my op but I believe they can put you to sleep if need be. what they did was numb the area of my neck where they were going to operate. 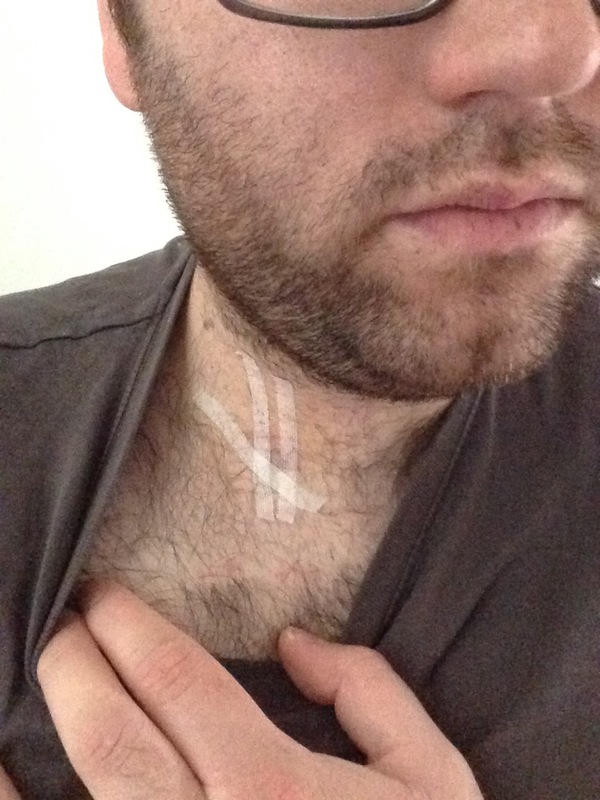 They cut a small hole in my neck cut through my shunt tubing and plugged the restrictor into both ends of the tubing. I didn’t feel pain as such during most of the op I did however feel lots of tugging on my shunt and could feel it in my head. I also felt the most strange feeling when they plugged the end of my shunt back into the tubbing. It was a sort of sharp pain that shot up into my brain but went away within seconds. I was then stitched up and after spending the rest of the day in the ward was discharged from hospital. The flow restrictor has certainly helped with the pain i was experiencing when stood up right as I can now stand and sit upright all day if I want too, I do still have a long road ahead though as currently still suffer with daily headaches, Shunt pain and migraines. Intracranial Pressure (ICP) Monitors or Bolts are devices that are used to monitor the Intracranial pressure inside you head. I have had two or these in the past and both have been different. My first ICP was back in June 2015 Just a few months after my VP Shunt was installed. I was getting some really bad head pain and had difficulty staying upright for prolonged periods of time so my surgeon decided that I should get the ICP moniter for a minimum of 24 hours to see what my pressure was. I didn’t really know what to expect when I arrived at the hospital as I didn’t read up about it before going in. I thought that if I didn’t know what was about to happen I wouldn’t scare myself but that gave me the reverse affect I was so anxious about what was in store for me. There is an option to be put under General Anaesthesia so your asleep for the operation but for some reason I was having mine done under local anaesthesia. When the time came I was taken down to the Pre op area where they get you ready to go to theatre as I was having the procedure done there. The nurses were talking to me throughout to try and keep me calm. 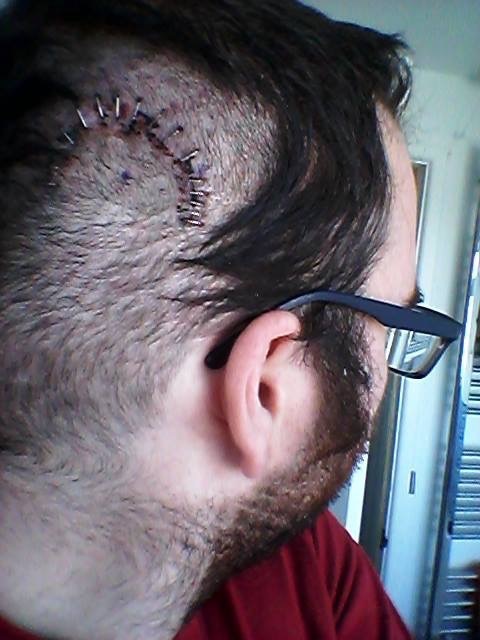 Firstly the surgeon shaved the front right part of my head where the bolt was going to be placed. After he cleaned and sterilised the area he made the incision. I felt the blood run down my right ear but didn’t feel anything else. I was expecting some sort of power tool to drill through my skull but instead (by the feeling I was experiencing) and the noise I heard seemed to be a tool similar to cork screw. After a bur hole was made in my skull the surgeon screwed the bolt to my skull and inserted the probe into my brain and connected it to the monitor, which happened to be some main box that converted the signals so that they could be seen on a standard laptop. 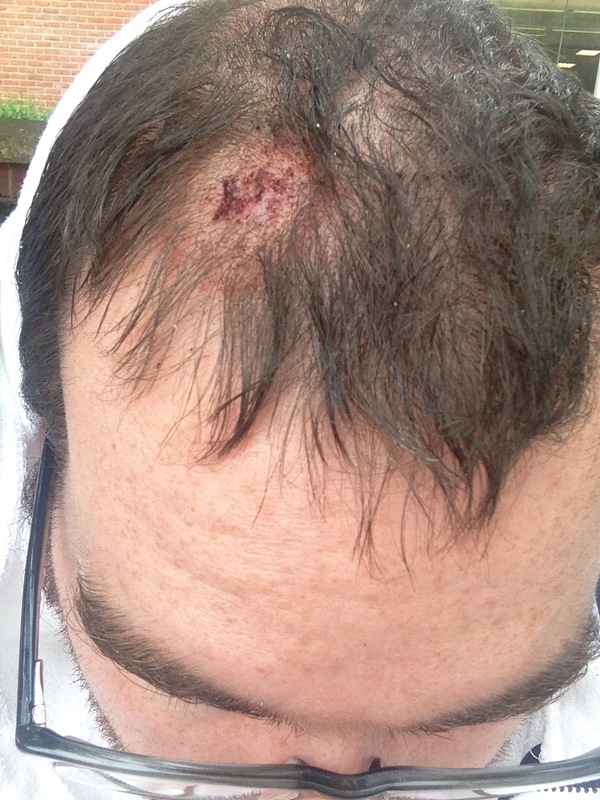 As the anaesthetic wore off it was painful and uncomfortable it looked like I had an areal coming out of my head. It was in for about 2 days before being taken out whilst I was still in the ward. I had a little local anaesthetic to the area before the doctor pulled the probe out of my head and unscrewed the bolt before stitching me up. It felt very strange at the time and painful after the anaesthetic wore off but the pain didn’t last to long and the procedure went well. My second ICP was a bit different. I had an idea for what was in store for me when going in for my 2nd ICP, but this one turned out to be a bit different than the first. It was being planned to be under General Anaesthesia, the reasoning I think is because of my problems with anxiety, but was told before the op that as they had difficulty establishing an air line when I last went under, they didn’t want to take the added risk. So the decision was made for the op to be under local Anaesthesia again. The differences this time were firstly the tools they used to make the bore hole this one resembled the old bit and brace (or like a whisk that has that gear like system) it made a lot more noise and I felt a lot more vibration in my skull. I also felt the probe being inserted a lot more this time than the last and that pain only increased as the Anaesthetic wore off. It was explained to me that the brain has many nerves in different places and that last time I was lucky in the placement of the bolt where as this time they seemed to find an area where i had a lot more nerves and that is what was giving me the pain. During my time in the hospital for this ICP I was also approached my some Scientists that were doing a study to see if you could measure the intracranial pressure from your ear canals by listening to sound waves. If this turned out to be correct it would mean that you would not need to have surgery every time that you needed your intracranial pressure to be monitored. I agreed to having these extra tests but unfortunately the equipment that they were using malfunctioned and they couldn’t complete the tests. When the ICP was taken out it hurt a lot more than the last and I experienced vertigo like symptoms similar to when I had my shunt inserted. I panicked as I thought back to previous experiences but luckily after about half a day i started to feel better and was discharged from hospital. Not the words I was expecting. I was taken to my local A&E after passing out in my home. I had been suffering with a chronic headache for what seemed like weeks, but Ive always suffered with headaches since i could remember so i thought it would eventually pass. The doctors had found out that I had an infection so was treating me with some local antibiotics whilst they did some further tests such as blood tests and CT scans. The doctor told me that he also wanted to do a Lumber puncture which is a procedure that involves a needle being inserted into your spine so that they can take a sample of CSF (cerebralspinal fluid). After the test was done I had a panic attack and fell asleep. When I woke up my wife was there and I remember telling her that I was felling bit better and that I might even be able to come home soon, I was wrong. That was when I was told that I was to be transferred from the hospital to another hospital that had a specialist neuro unit. This news terrified me and I thought the worst. 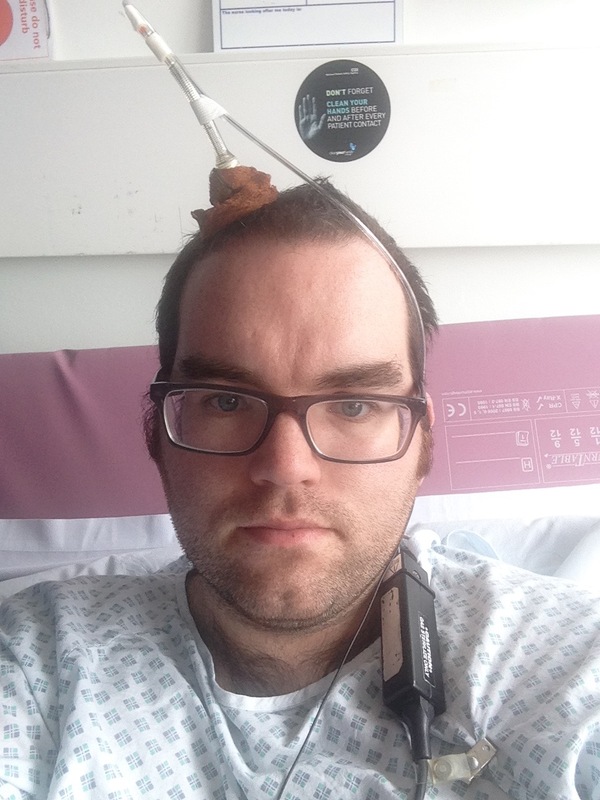 When I arrived at the other hospital I had some further tests that included two MRI scans that lasted nearly 2 hours in total before being told that I had hydrocephalus and would need surgery. The day after being told I remember sitting on the bed and staring at the floor just thinking. Thinking of how my life was going to affected by this news. Thinking of the family that were waiting for the news. My wife and two children that I loved and missed. I hadn’t seen the kids in weeks. I was then taken for my operation. A VP Shunt was inserted just above and behind my right ear. When I returned to the ward I felt awful. I was in the worst pain imaginable and was sick several times. The pain was worse when I was upright either sitting or walking so was given along with the usual pain relief like morphine, some anti-sickness tablets. I was showing no signs of improvement so was told that I would need a Lumber puncture to check my CSF pressure. The Lumber Puncture did not go well. The doctor that was attempting the procedure could not locate the area of my spine where the needle needed to be and the pain this lead too was excruciating. After a few attempts she decided to stop the procedure. Where i was in so much pain I didn’t want another attempt to be made but the doctor said that I had no choice so I was given a sedative to help me relax as a different doctor got prepared for the second attempt. The second attempt was just as if not more painful than the first especially the moment where he hit a nerve and what could only be described as a strange and painful sensation shot down my back and into my left leg and ended in the tip of my toes. It felt like my leg had been blown off. Soon after the doctor found the point he needed and was able to take a sample of my CSF. With the results of both my CSF reading and some X-rays of the Shunt the doctors said that the surgery was a success and as soon as I passed the pysio test I would be allowed to return home to complete my recovery. I just about managed to do the pysio requirements needed for me to return home because I was desperate to get home to my family. The journey home was hard as I was unable to sit upright for more than 15 minutes or so without experiencing pain, but we eventually made it. I got home and went straight to bed, (I had less pain when lying down) whilst my wife got the kids. As soon as I saw them I burst into tears. I knew I would have a long journey ahead of me to recover but with my friends and family now close by I was going to be more comfortable. Below is a photo taken just before my staples were to be removed. What is Hydrocephalus I hear you ask well the term hydrocephalus is from the Greek words “hydro” meaning water and “cephalus” meaning head. As the name implies, it is a condition in which the primary characteristic is excessive accumulation of fluid in the brain. Although hydrocephalus was once known as “water on the brain,” the “water” is actually cerebrospinal fluid (CSF) — a clear fluid that surrounds the brain and spinal cord. The excessive accumulation of CSF results in an abnormal widening of spaces in the brain called ventricles. This widening creates potentially harmful pressure on the tissues of the brain. The ventricular system is made up of four ventricles connected by narrow passages. Normally, CSF flows through the ventricles, exits into cisterns (closed spaces that serve as reservoirs) at the base of the brain, bathes the surfaces of the brain and spinal cord, and then reabsorbs into the bloodstream. CSF has three important life-sustaining functions which are to keep the brain tissue buoyant, acting as a cushion or “shock absorber”, to act as the vehicle for delivering nutrients to the brain and removing waste; and to flow between the cranium and spine and compensate for changes in intracranial blood volume (the amount of blood within the brain). What is the current treatment? Hydrocephalus is most often treated by surgically inserting a shunt system. This system diverts the flow of CSF to another area of the body where it can be absorbed. A shunt is a flexible but sturdy plastic tube, a catheter, and a valve. One end of the catheter is placed within a ventricle inside the brain or in the CSF outside the spinal cord. The other end of the catheter is commonly placed within the abdominal cavity, but may also be placed at other sites in the body such as the heart or areas around the lung. A valve located along the catheter maintains one-way flow and regulates the rate of CSF flow. Shunts are not perfect and can malfunction. Complications may include mechanical failure, infections, obstructions, and the need to lengthen or replace the catheter. 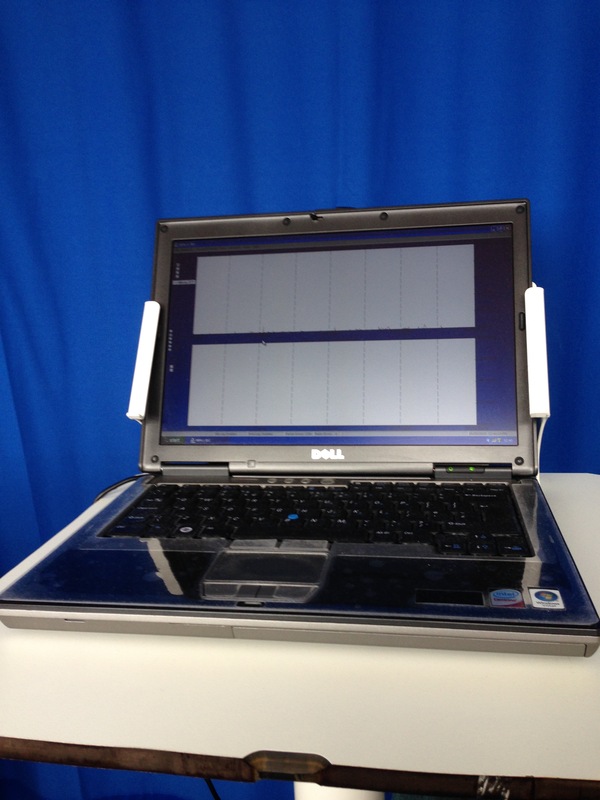 Generally, shunt systems require monitoring and regular medical follow up. When complications occur, subsequent surgery to replace the failed part or the entire shunt system may be needed. Some complications can lead to other problems such as overdraining or underdraining. Overdraining is when the shunt allows CSF to drain from the ventricles more quickly than it is produced. Overdraining can cause the ventricles to collapse, tearing blood vessels and causing headache, hemorrhage , or slit-like ventricles (slit ventricle syndrome). Underdraining occurs when CSF is not removed quickly enough and the symptoms of hydrocephalus recur. In addition to the common symptoms of hydrocephalus, infections from a shunt may also produce symptoms such as a low-grade fever, soreness of the neck or shoulder muscles, and redness or tenderness along the shunt tract. When there is reason to suspect that a shunt system is not functioning properly (for example, if the symptoms of hydrocephalus return), medical attention should be sought immediately. So this morning I woke up with a severe migraine and head pain for the forth day. Migraines for me usually last 2 to 3 days tops so my wife phoned the hospital and after a conversation with one of the healthcare professionals the decision was made for me to be taken to a and e.
The doc decided for me to have a CT scan which did not show anything so he loaded me up with a drug cocktail comprising of paracetamol, a double dose of ibuprofen, a couple of amitriptyline,diazepam, prochlorperazine and a pantoprazole to stop me from getting a an ulcer. The pain eased but didn’t go but i was sent on my way with some extra meds and told to rest and then go back to my GP for more meds in a week or so. With any luck these meds will take the edge off.